Imagine your body being bathed in the feeling of love. Reiki, literally translated, means Universal Energy. 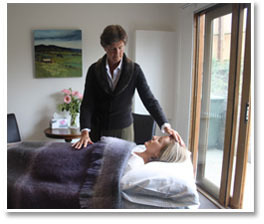 Pam feels that the easiest way to explain Reiki is the transference of the healing energy of Love. Pam also works with another system of energy called qi gong. This is a centuries-old Chinese energy practice designed to build up the spiritual, emotional, mental and physical bodies. This means that Pam’s capacity to focus her energy for you is increased. You will lie fully clothed on a massage table while Pam places her hands intuitively on different parts of your body. She will encourage you to close your eyes, let go of the outside world and to find your centre within. You may have a wide range of experiences during a session: seeing colors; feeling tingling in different parts of your body; sensations of energy moving; no sensation at all; deep relaxation. There is no “right” or preferred outcome. The best approach is to come with an open mind and just see what transpires. Images and emotional feelings can surface during a treatment. This can be a valuable part of the healing and Pam encourages you to allow these to surface so that they can be released. She will be there for you 100% throughout the process, regardless of how it unfolds. Grad Dip. Ed., Bach. of Arts.